Chain of Blows: If Odin causes a Critical Hit when he Charges or Attacks, he makes an additional free attack on the same target immediately after the first attack resolves. These additional Attacks may cause more attacks due to the Chain of Blows rules. 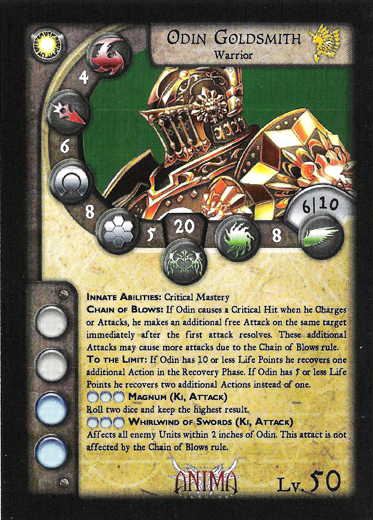 To the Limit: If Odin has 10 or less Life Points he recovers one additional Action in the Recovery Phase. If Odin has 5 or less Life Points he recovers 2 additional Actions instead of one. Roll two dice and keep the highest result. Affects all enemy Units within 2 inches of Odin. This attack is not affected by the Chain of Blows rule. Many say that there are people born with a special talent for war. With his almost seven and a half feet of height, chiseled musculature, and unbreakable spirit, Odin Goldsmith proves this maxim true. Over thirty years he has been present in every documented conflict and involved in hundreds of secret special operations. Today, at forty-six years old, he continues being the perfect soldier, an unstoppable fighting machine.